I can test anything from iOS 3.1 through iOS 5. The older OS versions are especially helpful to keep around since it is essentially impossible to replicate an issue on iOS 3.X without having a dedicated device kicking around. This isn’t a fragmentation thing though, this is more a look at how meticulous some iOS developers are for ensuring compatibility for even the most obscure use cases. How necessary it will be for developers to hold onto so many variations of iOS remains to be seen, but the adoption rate of the latest iOS versions looks to accelerate dramatically thanks to Apple bringing the OTA update feature to iOS 5. Of course this also means that those who are lingering on earlier versions of iOS will inevitably begin to miss out on new application features and full compatibility, as anyone using old iPhone and iOS gear can already attest to, and it’s likely that future iOS compatibility labs will include just two devices: an iPhone and an iPad. For the Mac side of things, it’s also interesting to note that Apple has a Mac compatibility lab at the 1 Infinite Loop campus in Cupertino, California that developers can schedule appointments to use. You can read more about the Mac compatibility lab at Apple.com and explore its vast amount of Macs, but apparently no such lab exists for iOS gear… yet at least. This picture makes my single iPhone look so lonely. At least I have a few Macs to balance it out. Oh, Apple supplies iOS devices at the labs too. Look at the PDF of their complete inventory. 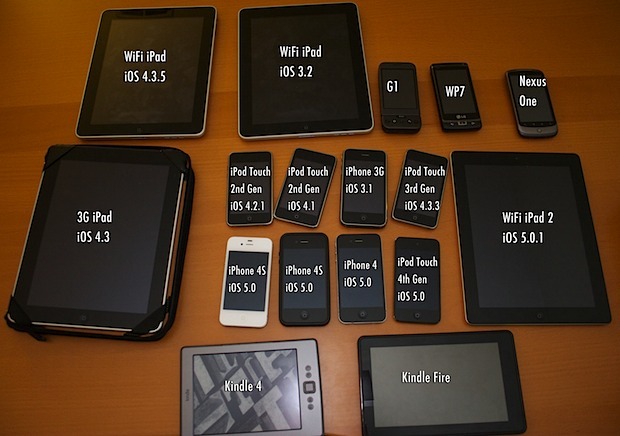 Near the bottom, after pages of Macs, you’ll find an impressive iOS collection.